They say you should plant garlic on the shortest day and harvest it on the longest. But December to June would, by my reckoning, be a pretty short growing season. 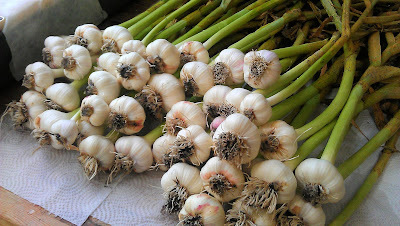 For a long time I was unsure when the best time to plant garlic was. Autumn, winter, or even wait until spring - I've had reasonable results after planting it in spring before? But it has been less of a mystery to me since it was explained that it's not so much the time of year that you plant garlic, it's in the timing. Garlic likes to have some proper chilly weather after being put in the ground. Around ten days around freezing point will do nicely even if you don't see the first green shoots coming through until a month or so later. So it's not so much a case of checking the calendar for the best time to plant garlic, as looking at the weather forecast. 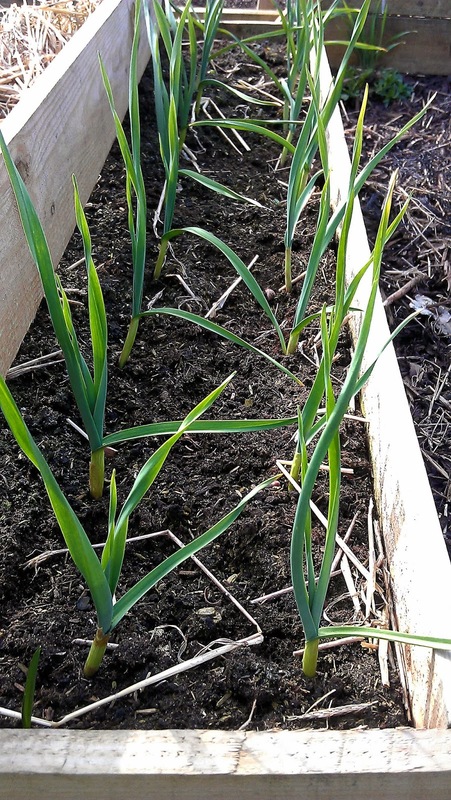 The other great garlic tip that I've found really works is to have a nice big bonfire on your garlic/onion bed - before you plant them in the ground, obviously. Once the fire has gone out and cooled down, spreading the ashes over the bed and digging it in is good for the alliums - they like a bit of potash. My garlic - five firm fat bulbs of Solent Wight - arrived (finally) today, just before the freezing temperatures forecast for the end of this week going into the weekend. Each clove needs to be separated from the bulb and pushed into the soil, root end down, tip uppermost and 2cm or so under the surface. I tend to plant them a bit too close together: 15cm-20cm between each clove is probably best. Specific weather conditions aside, the green spiky leaves usually surface early in the New Year. I generally leave them be after that. Some light weeding and light watering is normally all that's needed. By June, some of the spikes might develop flower buds, which are pretty, but need to be pinched out. You want your garlic plant to put its energy into developing a nice plump bulb, not making flowers. They should be harvested when the leaves turn yellow and wilt - mine have usually developed a bit of rust by then - but it's always later than June 22, the longest day. More often the middle of July. It's important to dig up the bulbs before they split apart into separate cloves - these won't store well.